Combining performance criteria for its craft with the achievement of extremely high standards in terms of quality of life on board, has always been one of the "musts" that characterise the operational strategy of the Pershing brand name in the Ferretti Group. A principle that finds its maximum expression in this Pershing 88', the last and largest boat produced by the company from Pesaro. Tilli Antonelli, the boatyard's chairman, and Fulvio de Simoni, designer of the hull, have together taken care of all the aspects that, in this sense, are able to offer maximum assurance, using the most up-to- date technology not as a mere gadget but as an essential support in the design, in the production and furnishing of the hull. The bottom has been specially designed to guarantee excellent efficiency with the Arneson transmission system, together with surface propellers that contribute to achieving a maximum speed of 39 knots, offering moreover, a "soft" navigation. The external layout, despite the fact that the ship's sides are quite high above the water - a solution that has made it possible to create considerable internal volumes - maintains that fluidity of line and the proportions necessary for an exciting visual impact in keeping with a hull of this importance and performance. At the centre of the boat, below deck, is the boat owner's stateroom, that utilises the entire width of the hull and which, by fully exploiting the spaces, is provided with a double bed positioned sideways. There are two guest staterooms, both with twin beds, as well as the VIP stateroom, situated at the extreme bow, all with their own private bathroom. 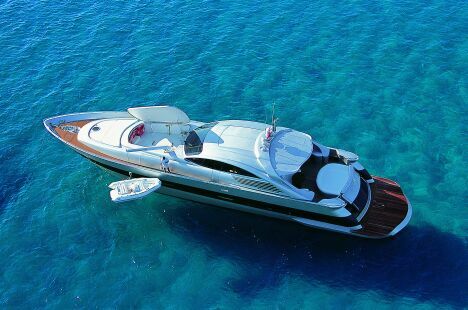 With 26.96 m. overall length and 6.23 m. wide, the Pershing 88' is motorised with 2 MTÙs, each of 1,826 HP. Pershing S.p.A. - Viale Marche 2/4, 61030 Castelvecchio di Monteporzio (PU) - Tel +39 0721 956211, Fax +39 0721 955784 - website: www.pershing-yacht.com - e-mail: info@pershing-yacht.com.